Same day smile makeovers can be a great option for people who want a great looking smile but don’t have the budget for porcelain veneers. Composite Veneers, Chairside Veneers, Direct Veneers or Bonding. All these names are referring to the same treatment. The dentist becomes the artist of the smile, creating the tooth color and shape of the front teeth utilizing special tooth colored filling materials. The vast majority of dentists utilize a one layer of composite technique when creating a direct veneer. This is the simplest technique that also requires the least amount of specialized filling materials to purchase. When dentists want to do better direct veneers, they begin to incorporate a two layer technique to design the new shapes and shades of the front teeth. While this is an improvement over a one layer technique, the results are still less than natural. 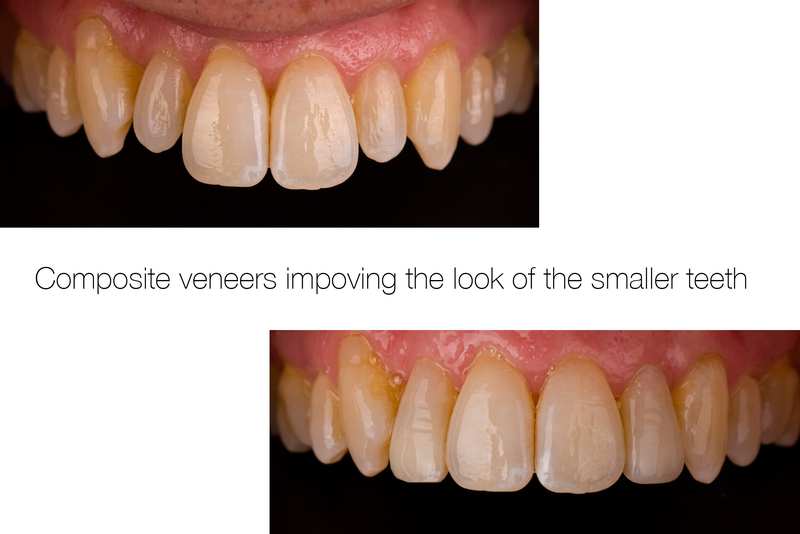 Becoming proficient in anterior direct veneers teaches a dentist to appreciate one of nature’s most amazing features – the interface of dentin and enamel – and recreate it with an instrument. 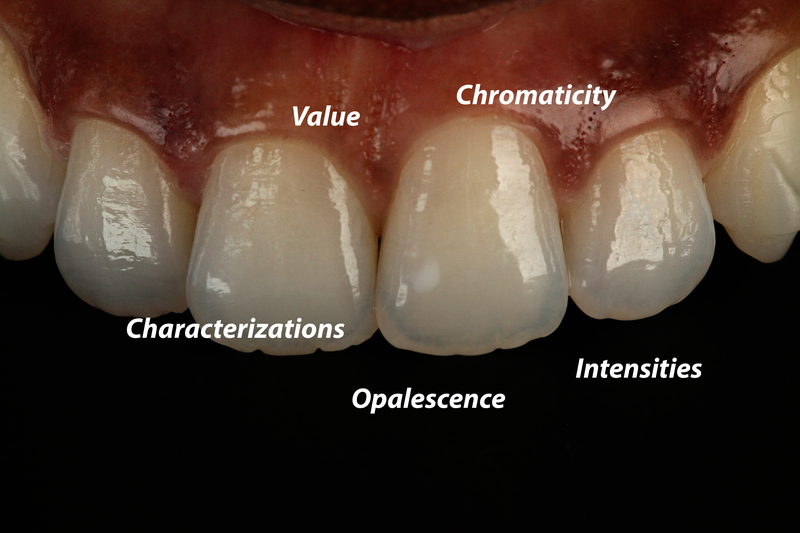 A bio-mimetic incremental layering technique is mandatory to achieve indiscernible aesthetic composite veneers. This technique necessitates employing a number of different shades of enamel-like and dentin-like materials. A Smile Stylist’s technique of stratification restores lost enamel and dentin layers to their proper location and thickness by using the five color dimensions of teeth as a guide. Smile Stylists study the subtle nuances of natural teeth and spend long hours in practice to be able to recreate it with instruments and special filling materials, this is very different than the vast majority of general restorative dentists, who do not purchase the correct instruments and aesthetic composite materials necessary to provide ideal aesthetics or practice with the materials to improve their skills. Smile Stylists spend hours in individual study utilizing artificial teeth to understand the unique properties of dental composites on the market. There are positives and negatives to composite veneers. They enable dentists to charge lower fees than porcelain veneers, because there is no lab bill for the veneer. Each veneer is made by the dentist using tooth colored composite directly onto the teeth. Because the veneer is made entirely by the dentist, it is especially important to do your research to find a dentist who has an artistic eye and the experience to pull off a natural looking result. This is one area that really pays to have an experienced dentist. This process is an art and it requires knowledge of the details of tooth shapes, morphology and translucency and the principles of smile design. 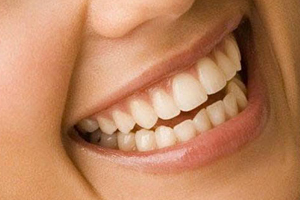 Composite veneers can make teeth whiter than tooth bleaching using peroxide. They can also make smiles wider and correct some chipping, tooth wear, crowding and spacing. Composite veneers typically cost less than porcelain veneers. The drawbacks of composite veneers is that it is much more difficult to make extreme changes to the smile. If the teeth are more crowded or have moderate or severe wear and bite changes, there are more benefits to using porcelain veneers. Composite veneers have a higher chance of getting small chips and staining. While the composite materials are strong, the are not as strong as porcelain. The good news is that these situation can in most cases be repaired easily. Composite veneers will slowly darken over the years and the only way to lighten the veneer is to replace it. Composite also looses its polish quicker, but they can be repolished at cleanings. The lifespan of composite veneers is 7-10 years. Porcelain veneers do not stain or darken over time. Porcelain veneers can last 15 or more years. 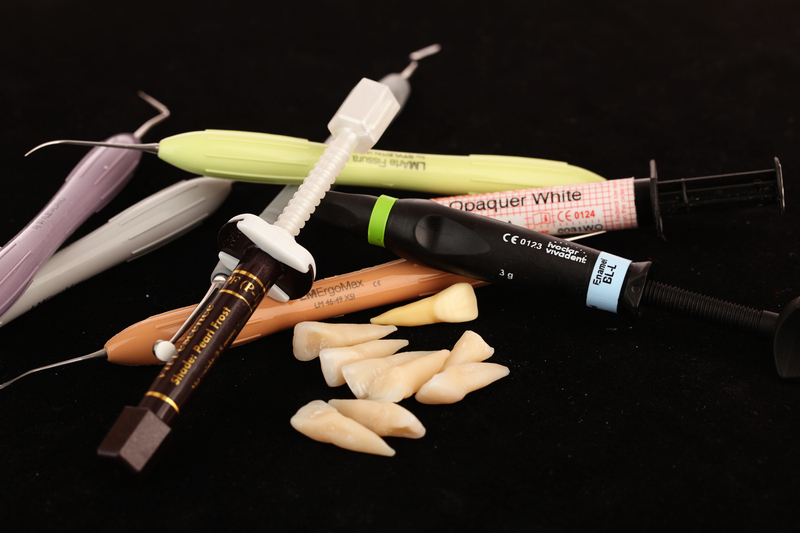 Porcelain veneers are created by ceramists in dental laboratories. If the ceramist who makes the porcelain veneer is not highly skilled or the dentist is using an inexpensive lab, the porcelain veneer will look fake. If the dentist uses a biomimetic layering technique for composite veneers, the veneer can look translucent and vital like a nice porcelain veneer. The best dental laboratory ceramists can usually make porcelain veneers look better, more natural and vital than a composite veneer. Make sure if you are getting porcelain veneers, your dentist is working with the best laboratory ceramists. Smile Stylists only use the best dental ceramists in the world. Krystal recieved 10 composite veneers to make her teeth whiter, longer and her smile wider. 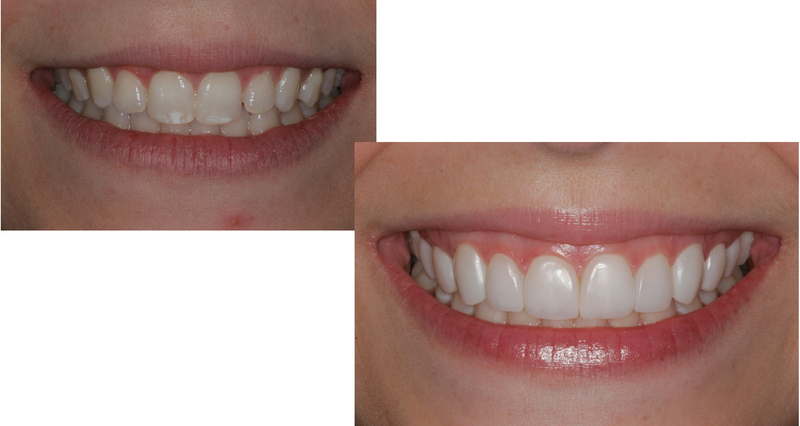 She also did not like the white spots on her teeth and the composite material is able to cover the spots. While composite veneers can be done in one appointment, we often choose to bring the patient back for a second or third appointment, to finalize the details of the new teeth and smile. This example illustrates composite veneers done by Smile Stylist, Dr. Olitsky that have subtle translucency created by cutting back and internally layering each veneer.